← The phonics check: what does it prove? This post concludes our series on phonics by asking what has been gained by politicians imposing their will on teachers. It draws on research by Professor Dominic Wyse (UCL IoE) among others, as well as official data. The issue is not whether to use phonics to teach reading. Phonics has been a central aspect of teaching children to read for centuries. Phonics is about linking sounds to letters, so it is almost impossible not to use phonics when reading an alphabetical language such as English – unlike Chinese with its writing system based on pictures. The big question is how an obsessive politician, now Minister for Schools, has managed to impose his will and compel teachers to use one particular approach to phonics. Phonic skills were taught almost universally and usually to beneficial effect… Successful teachers of reading and the majority of schools used a mix of methods each reinforcing the other as the children’s reading developed. Skilful teachers know how to combine various techniques in connection with reading for pleasure. 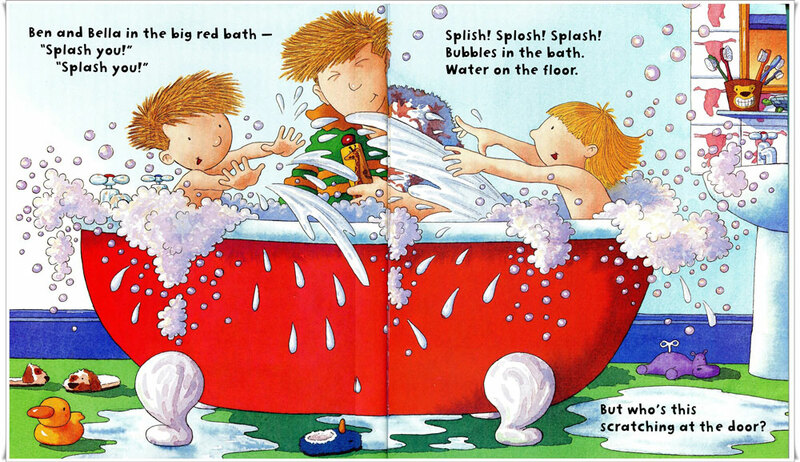 Children’s picture books make strong use of repetition, rhyme and sounds to create an effect. 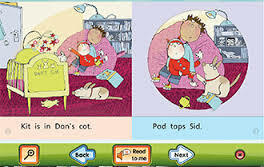 We can see, even on this opening page, that it is perfectly feasible to connect phonics with real books. the contrasting vowels in Splish Splash Splosh. There is fun in the way sounds are repeated and varied for effect (alliteration, onomatopoiea). Getting children to identify letters that correspond with sounds within words is part of analytic phonics, but this can lead into synthetic phonics: children can make up different words using the letters of B-e-n, b-i-g, r-e-d. There is absolutely no reason to restrict teaching to one version of phonics. Crucially, this is not divorced from the young readers’ pleasure in characters they can identify with – real kids, a fun-loving dad, bubbles all over the place… and the anticipation of turning the page to find out which animal is scratching at the door? Synthetic phonics, on the other hand, tends to be artificial and often meaningless. This is not surprising since the method is restricted to regular words, and many schemes require teachers to avoid some of the most common words in our language for months on end. You can hardly write a sentence in English without the, is, was, here, where. Pod tops Sid? Who cares! In many European countries, children learn to read quickly using mainly phonics-based methods. This is fine in languages which are phonetic – i.e. one letter = one sound. English is different. Around half of our most frequent words are irregular. In some words, you need to get to the sixth or seventh letter before you know how they are pronounced. Because of this, teachers generally combine recognizing some words by sight with sounding out others. In fact, teaching by synthetic phonics alone leads some children to try to sound out every word, slowing them down (look-and-say). Without relying on words we remember on sight, decoding is slow and laborious. Major reviews of research have failed to establish that synthetic phonics is superior to other methods, yet it has been imposed dogmatically on teachers and children. 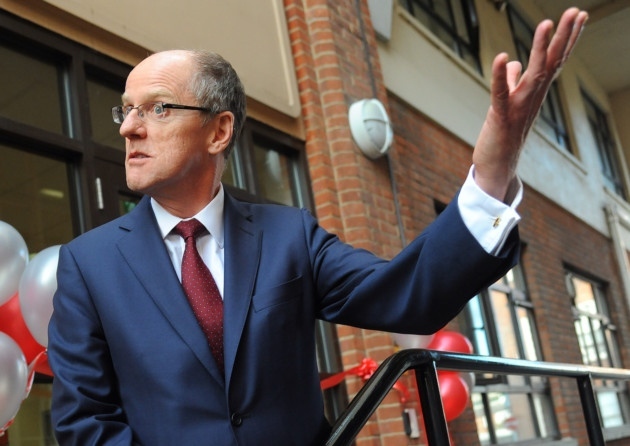 This was a massive leap of faith by ministers, but has it worked? There is no sign here of a dramatic improvement despite the political zeal about synthetic phonics. We would also expect the dramatic rise in the pass rate for the phonics test (Y1) to be reflected in KS1 results a year later (Y2). The phonics test results have improved dramatically but with virtually no change in actual reading. It is time Government ministers stopped imposing their will on the teaching profession. Please read our series of posts showing the lack of evidence behind this Government’s insistence on the ‘synthetic phonics’ method. This entry was posted in Accountability and tagged accountability pressures, assessment alternatives, National Curriculum, Ofsted, phonics, phonics check, politicians, testing. Bookmark the permalink.